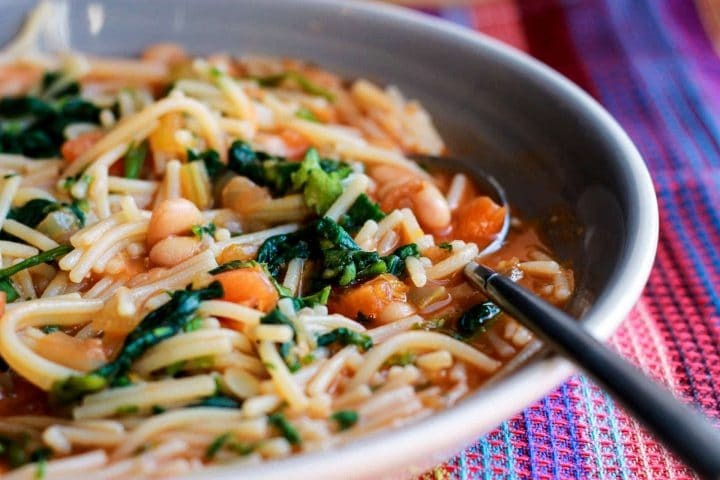 Warm up your week with this healthy Italian vegetable soup that's easy to freeze ahead and make ahead. 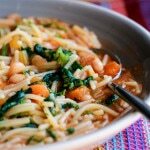 This recipe for Ribollita Italian Soup is a delicious hearty soup that’s healthy and comforting. 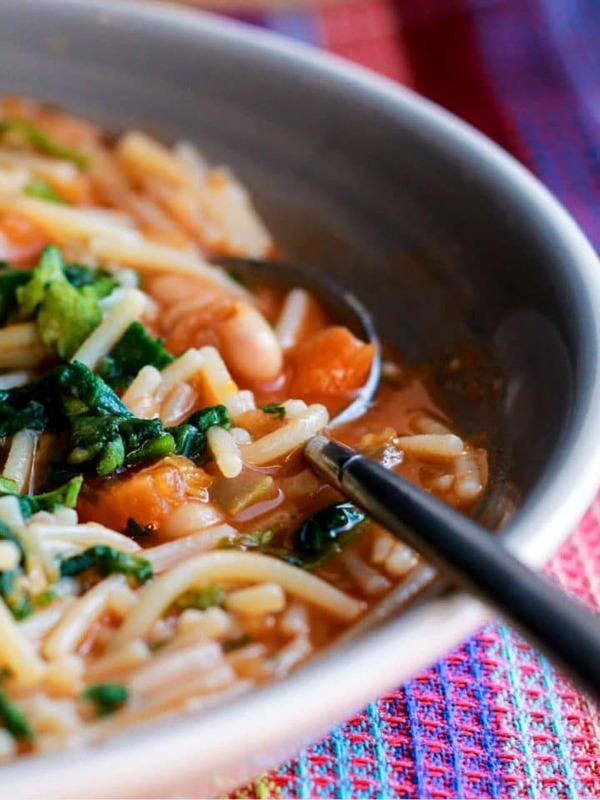 Very similar to pasta fagioli, it’s a cross between a soup and a pasta dish. This is a wonderful hearty Italian soup. It’s very much an Italian ‘peasant food’ which is filling food that is inexpensive to make with lots of flavor. My grandmother always made these kinds of dishes and for me, they are real comfort foods. It’s traditionally made with day old bread instead of pasta, but my grandmother made it with pasta and that’s how I like it. Heat some olive oil in a large pot over medium heat. Add the onion, carrots, celery, salt, and pepper. Cook until the onion is soft (about 5 minutes). Add the garlic and fry 1 more minute. Add the tomatoes and stir, scraping the bottom of the pan. Add the beans, herbs, stock, and Parmesan rind. 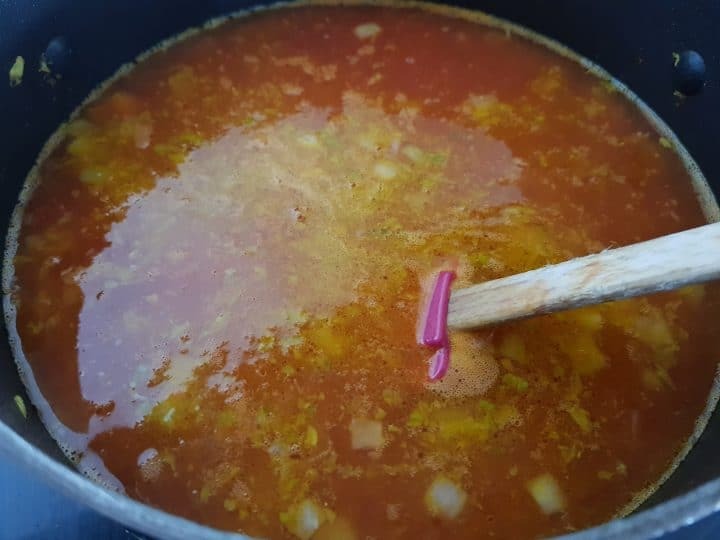 Bring the soup to a boil, reduce heat and simmer for 30 minutes. Add broken up spaghetti lower the heat and cook until tender (about 10 minutes) stirring frequently to keep the pasta from sticking to the bottom of the pan. Mix in the spinach and discard the rind before serving. Don’t have spaghetti? Any pasta you like will do just adjust the cooking time accordingly. 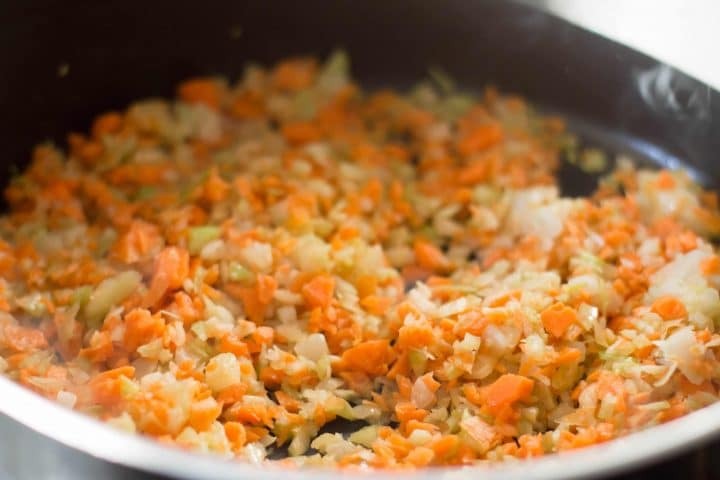 This can easily be a vegetarian dish by using vegetable stock. 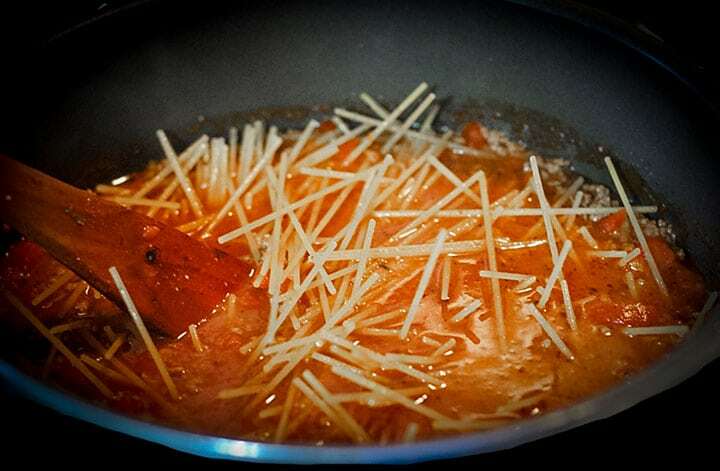 If you plan to freeze this soup, do not add the pasta until it’s thawed and reheated. Add 4 ounces of pancetta or chopped bacon until crisp before adding the onions. I make both versions and the pancetta adds a lot of flavor. Heat the oil in a large pot over medium heat. Add the onion, carrots, celery, salt, and pepper. Cook until the onion is soft (about 5 minutes). Add the tomatoes and stir, scraping the bottom of the pan. Add beans, herbs, stock, and Parmesan rind. Bring the soup to a boil, reduce heat and simmer for 30 minutes. If Using frozen spinach, it should be added at this point and mixed in before the pasta. Add broken up spaghetti lower the heat and cook until tender (about minutes) stirring frequently to keep the pasta from sticking to the bottom of the pan. If using fresh spinach, add the spinach before serving and cook until tender. Discard the cheese rind.